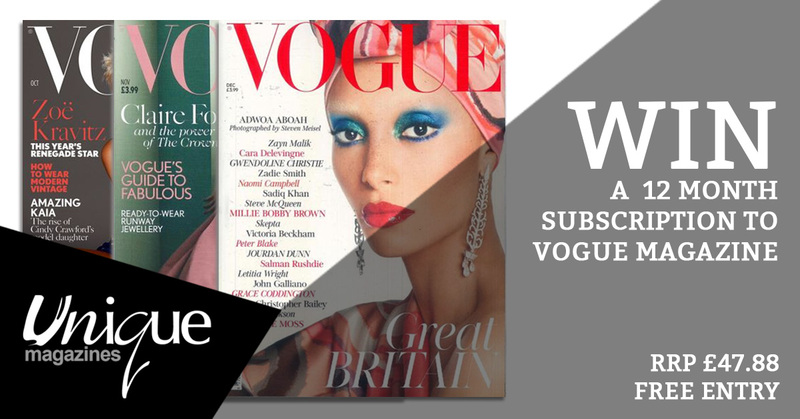 We’re giving away 15 Vogue magazine subscriptions this Christmas! This is a FREE to enter prize draw with no purchase necessary. Sign up to receive exclusive offers and updates about your favourite celebrities from Unique Magazines and we’ll enter you into a draw to win a 12 month Vogue magazine subscription! Agree that your personal details may be used by Unique Magazine for marketing communication. Understand that Unique Magazine will not pass personal details to other 3rd parties. Are aged 18 or over and a UK resident. Understand that individual competition dates are displayed on each competition page and winners will be selected at random and announced within 48 hours of the competition closing. Agree that persons connected with Unique Magazine or the competition partner are not eligible to enter. Agree to enter each prize draw once, multiple entries are not accepted. Agree that should any prize be unavailable, a prize of the same value and specification will be substituted at our sole discretion. Agree that prize draw winners will have their names published on our winner’s page. Previous Previous post: School Competition – Win with Bayard Publishing!